From a fermentation perspective, your traditional “hard” cider is basically apple wine. It certainly isn’t beer. No hops. No malts. Just apple juice and the magical yeast that turns sugar into alcohol. So, I hope you’ll indulge me in this, a wine column, as I write about apple wine, better known to fans of craft beverage as cider. I don’t even like calling it “hard” cider. There’s sweet cider which is for babies and for mixing into cocktails and there is cider which has alcohol. And really, why not just use cider-cider in your cocktails, anyway. 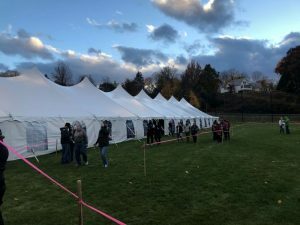 Franklin County just wrapped up its 24th annual Cider Days. This incredible event doesn’t quite get the attention I think it deserves. It’s the Green River Festival of craft beverages in our region. What began as a small celebration of the Valley’s “cider renaissance” in the 1990s has grown into one of the premier cider events in the country — with folks coming from all over the world to learn about how to turn New England’s greatest fruit into wine. Now, I love so many of our Western Mass ciders. But I admit, the style of cider I prefer is Spanish: so stinky, funky, and sour. 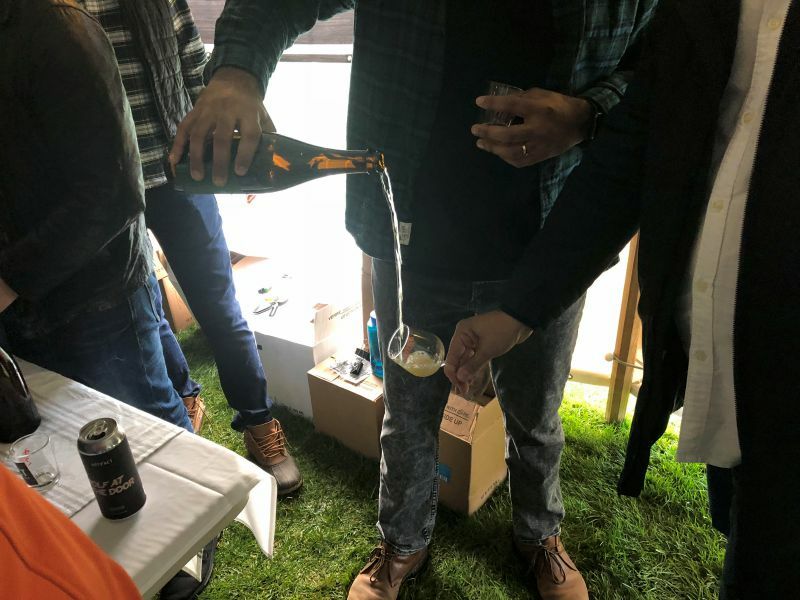 And how lucky I was to sample so many stellar sidras from Spain when those producers made their way to the Cider Days salon at Unity Park in Turners Falls. I’m not sure if you’ve ever seen how some of these Spanish sidras are poured. But do you remember the Tom Cruise movie “Cocktail,” where he performs all sorts of fabulous feats of bartending derring-do? That is how a real Asturian Spanish sidra should be poured. Take a glass and hold it as low as you can in your “goofy” hand and take the bottle into your dominant hand and hold it as high as you can over your head. Now, try and pour that cider into the glass. Unless you are a professional at this, you have now made a horrible wet mess. But as I witnessed at the salon, if you are a professional you may have made only a slightly smaller mess, but you still made a mess. Yet you also got some cider into the glass. The most interesting thing about this style of pouring or, as they say in Spanish “escansiar,” is it’s not just for show. 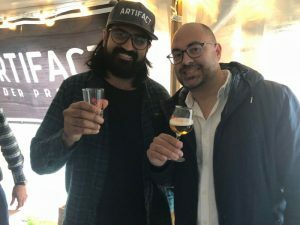 José Pardo, who billed himself as the “expert manager” from Trabanco Cider in Asturias, had a more dire description as to what happens if you don’t drink the cider quickly. “You need to drink it right away. And if you keep it for too long, we say it dies. It’s dead. That’s why we love to drink it so much. We drink and drink and we are partially drunk all day.” Apart from adding some bubbles to the otherwise still wine, Pardo says it’s almost like decanting. “We pour it to gain oxygen, and to be shaken to have a better taste. We say the flavors open when you pour it like that.” And Pardo says it’s not just the fancy method of pouring that matters, “The glass really matters — it has to be wide and thin because the vibration of the glass matters to shake the cider better.” Most wine snobs will not tell you this, but if you really need a wine to open up quickly, put the cork back in tight and shake that bad larry hard. As much as I love the stinky, funky, fancy pourin’ Asturian cider from Spain, this is New England. We’re the home of Johnny Appleseed and apple pie and West County Cider. So what does Asturias have to teach us here in Western Mass? We are not Asturias. They have been making their ciders since at least the first century BCE. And, to be sure, their sidra is an acquired taste. But Western Mass has some kickass apples to work with, a young but strong cider-making tradition thanks to Cider Days, and some incredible producers who are working our apples into fantastic fermented beverages. I love our vibrant beer culture. I love our burgeoning local wineries. But our apples might be where it’s at. Now pardon me as I go and mop the floor of my kitchen after my failed escansiar.